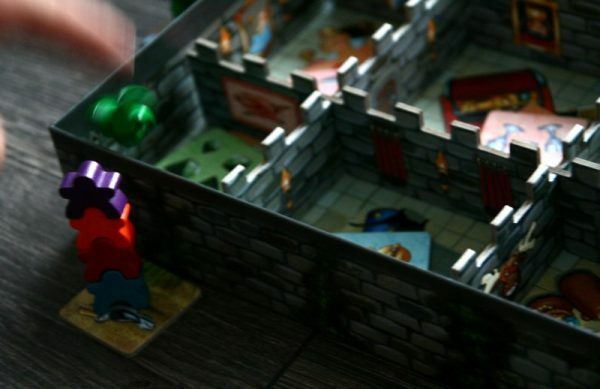 Each castle looks impregnable, but only until the moment, when true knights decide to grab its wealth for themselves. This time, fighters are in jure, because they lived for several years in this stronghold. But the king did not pay them their soldiers pay, and when they revolted, they were driven to a nearby forest. Now they return with a plan to overcome the high walls and get gold, they ruler owes them. 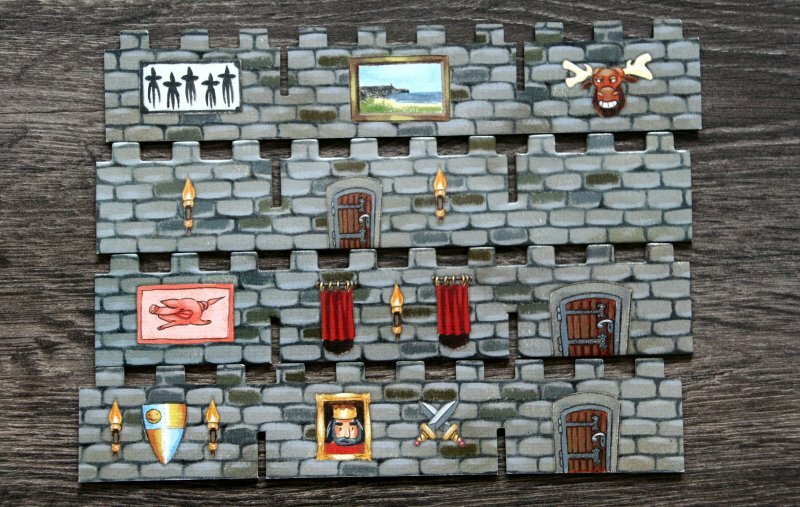 For money and fairness, we go with knights in the board game Burg Klettermax (Klettermax Castle), designed by Gunter Baars. 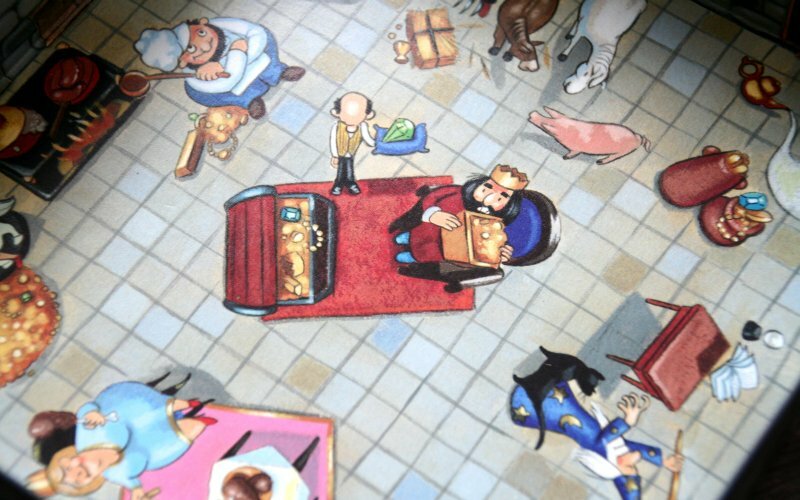 His idea was embellished with pictures by Stephan Pricken and finished work was offered to HABA, which released it with joy as their novelty for 2012. 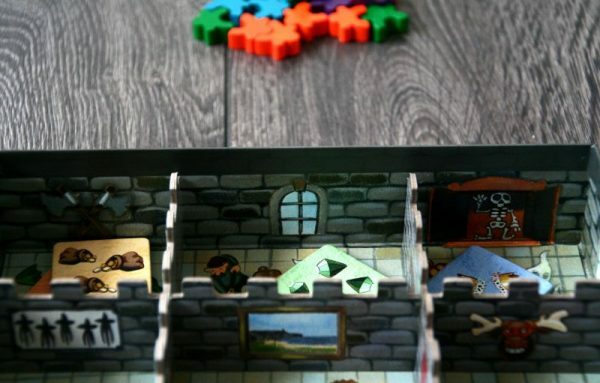 We will visit the castle now, a few years later, but we can see, that the walls are still standing and there are still sovereigns to capture inside the treasury. 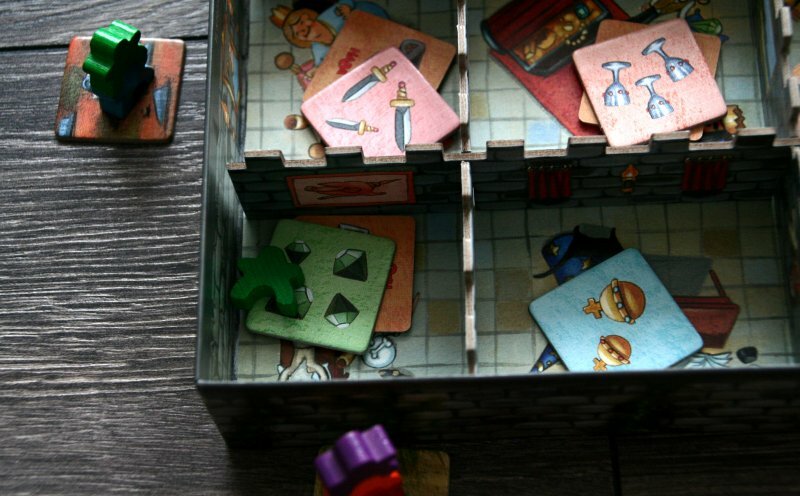 We see it from cover of smaller box, which shows a pyramid of knights trying to get to the king. He threatens them from a nearby tower and does not want to surrender remaining gold from the treasury so easily. 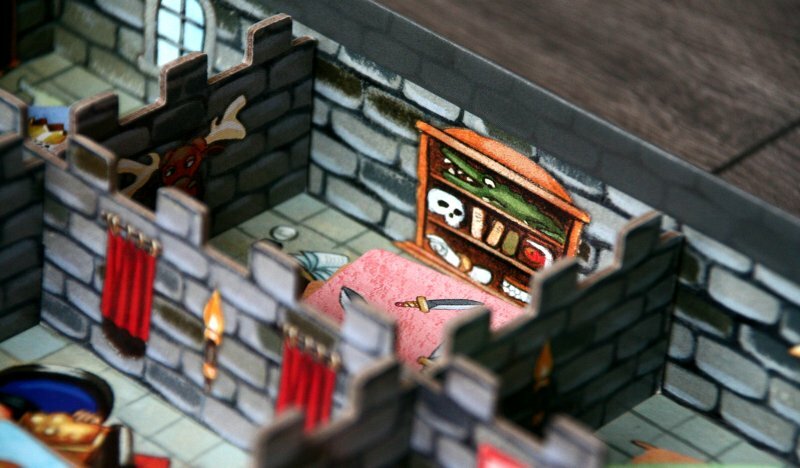 At the bottom, we find a quartet of cardboard walls, which look like stone-made thanks to the illustrations. 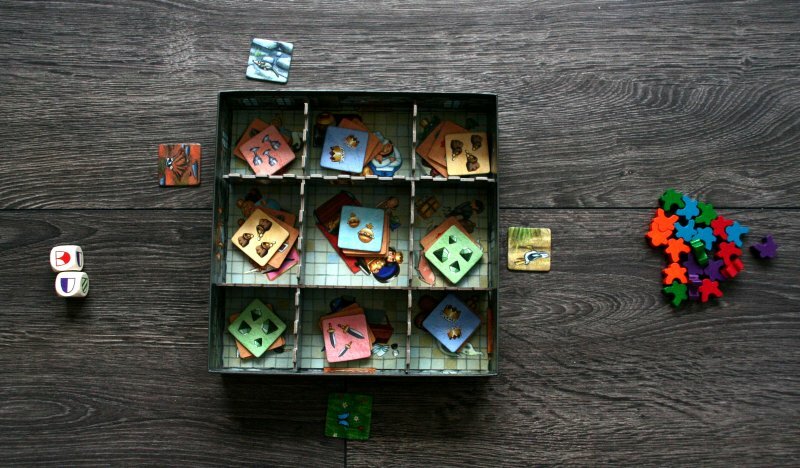 But there is also a bag with wooden tokens, pair of dice and then a pile of square tiles, all containing symbols. 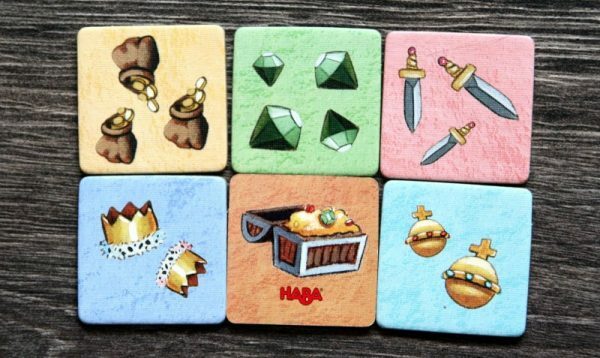 It is these pieces, that are forming the treasure, which is located in the chest and will be before start of each match littered around the castle. At the beginning of the game, it is just necessary to fit the castle walls, which then create building to get inside, together with the bottom of the box. 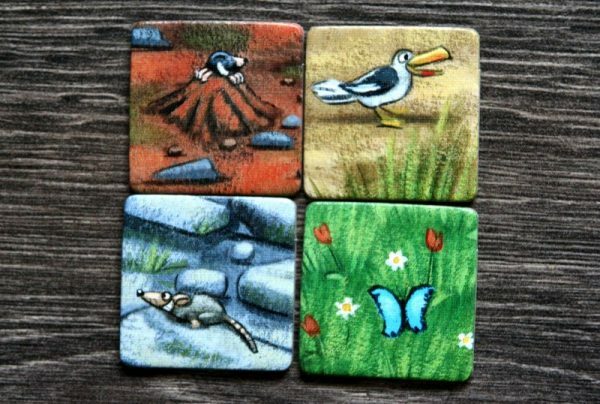 Individual players will each choose only one tile, which serves as their starting position and comes in different colors with different illustrations. Before, players choose, which room would they like to rob first, treasure tiles should be randomly divided in all nine quarters, three inside each one. But only the top will be visible. 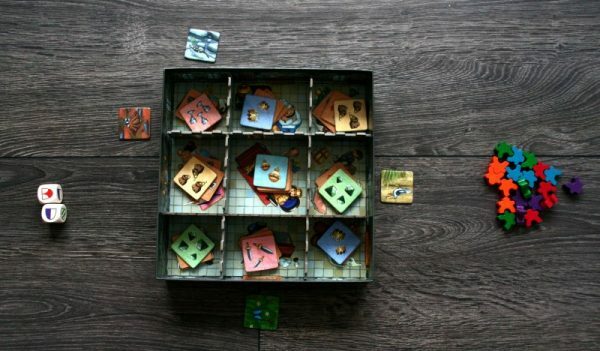 Then, each player chooses a spot (next to one room), where he places his small base for soldiers. First, participants get their hands on a pair of dice and try to get the best combination of icons. Each player is of course playing separately. Each shield, which he acquires, allows him to take one knight from the reserve and recruit him into his ranks. 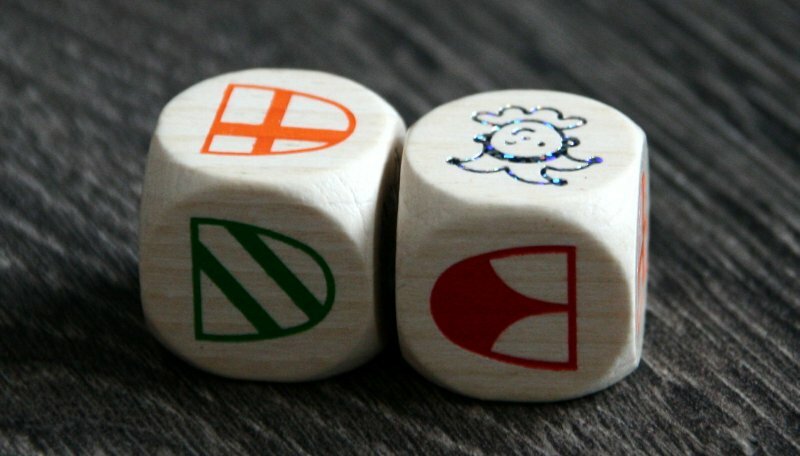 Color must match coat of arms rolled (if a player did not roll joker, that matches any color). 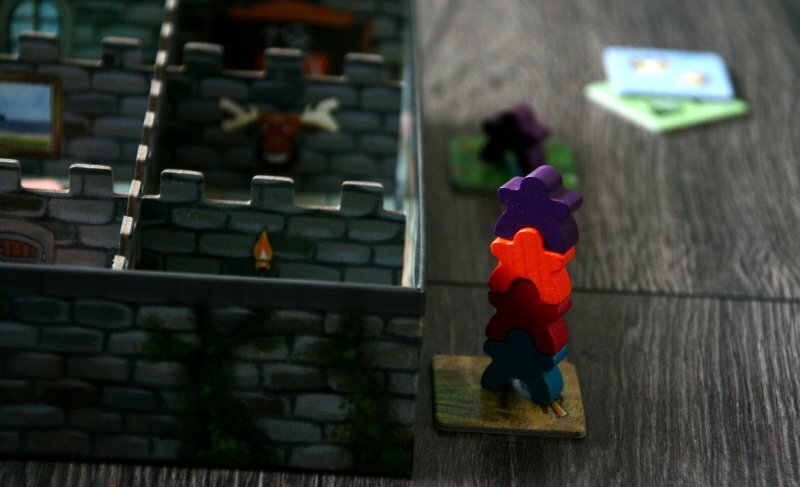 These figures will serve player as means to build their tower, building knights nicely on the back of one another. But each pyramid may contain only one knight from each color. It often happens, that a player rolls coat of arms, which he already has in his pyramid. At that moment comes an interesting situation, because he has to offer this piece to his rivals in clockwise direction. Anyone, who needs it, may leave the figure, if it fits into the tower or passes it further. 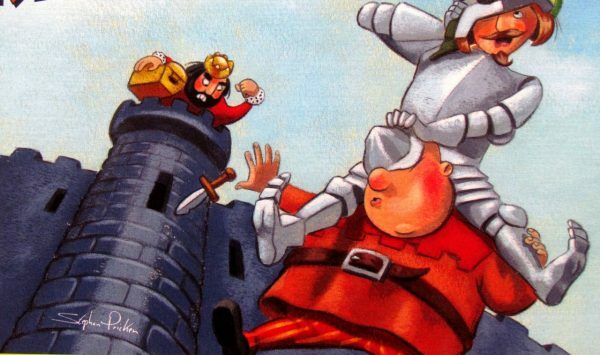 In the event, that noone needs such a knight, active player gets reward in the form of free choice of one fighter in other color. Once a player successfully gets all five knights onto his platform, he may try to flick top fighter into one of the rooms. This may bring him one of the treasure tiles waiting inside. But the room can also be already empty, so aiming is a good way to do. If successful, all knights are returned to the common pile and player begins construction anew. Raid continues until one of the attackers obtains his fifth treasure. At that moment, there is reason to celebrate, and not just because player becomes rich, but he also has won the game! 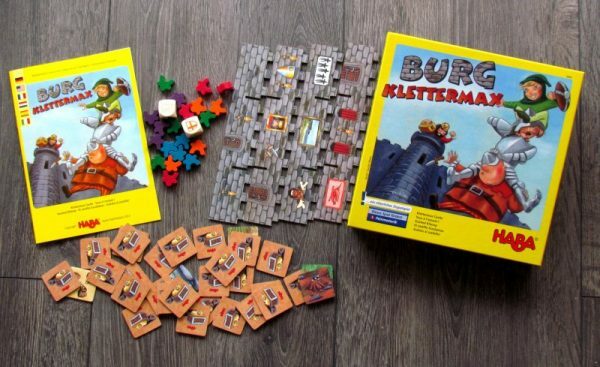 Burg Klettermax is a game for all smart thieves, who want to take back, what was theirs. Just a few knights to build another one on the back is all they need. 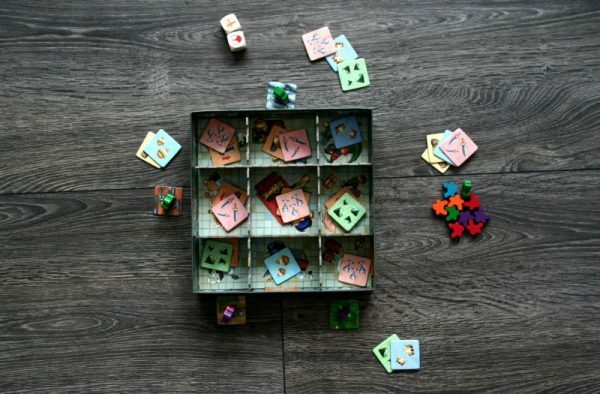 Yes, it takes a little skill and a good dose of luck, because whole situation is determined by success of the dice rolls. And as it is with the dice, they can not be trusted. Not for a second. Coincidence is just unpredictable and that is reason, why the game plays best with very young players. 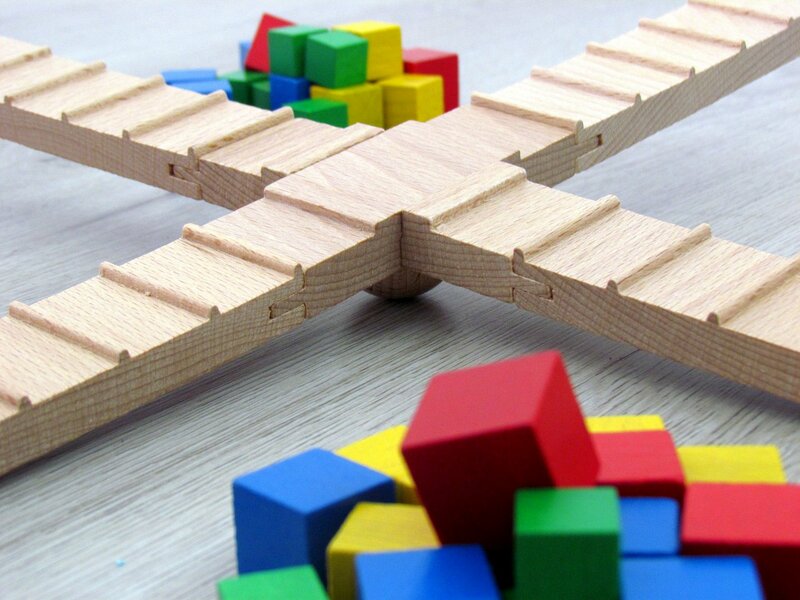 There is no need at all to be able to count or anything else, just to have clever fingers and ability to stack knights one on another. Fine motor skills are indeed main things, this game can do for small kids development. We most appreciate the fact, that no turn is wasted in this game. 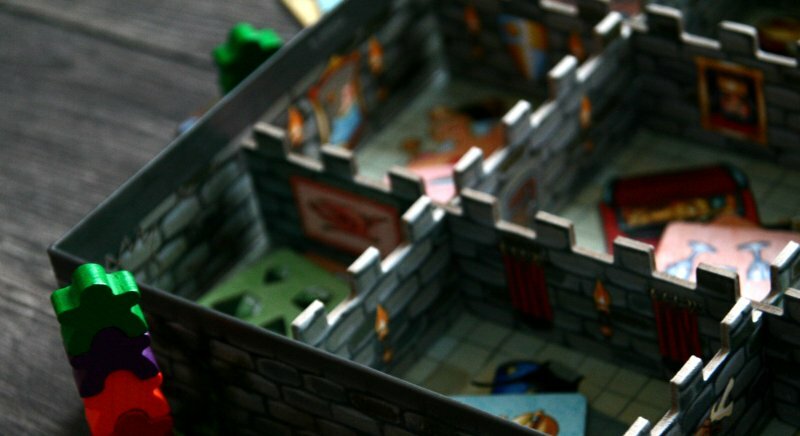 Because knights are forwarded to neighbors, players must constantly watch the game and are not bored even, when rivals play. Treasure hunt is not only about, who builds tower of the knights first, but also of skill in flicking. Because the game has no readily distinguishable elements, there is a very high replayability. Children will appreciate funny illustrations and 3D board. They will be entertained by failures of others and enjoy the tension until the end. Anyone can win, even when he is currently in last place. Burg Klettermax is a chance for young players from four years up to prove their dexterity. 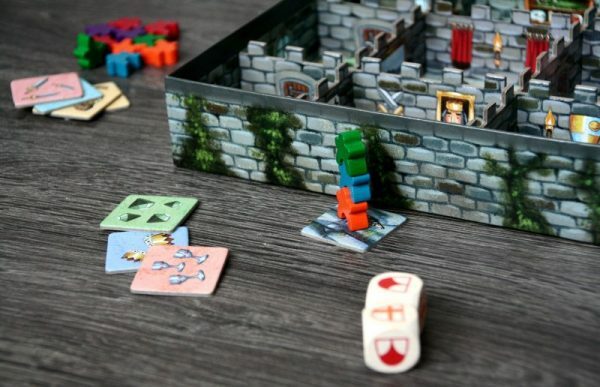 In combination with dice, it is quite nice experience, which guarantees fun in many areas. Unpredictability is completed by flicking, which decides about treasure captured. Burg Klettermax is an excellent game for little ones, which deserve a place on the shelf in the nursery and at your home. Alternativní názvy El castillo Escalamax, Cat Burgling Knights' Castle, Kasteel Klimop, Klettermax Castle, Scalata al castello!, Tous à l'assaut !